Single item delete – this process is done if you have only 1 item to delete. In the Price Monitor page click on the red trash can button. 2. Bulk delete – this process is for multiple listings that you want to delete. Select the listings that you want to delete. On the top right corner of the page click the red trash can button. By doing this processes, you will end up on the same window that will ask you how your listings will be deleted. In this example we will show the delete options for eBay, different targets might have different deletion options. This option is used mostly when you want to re-add an item to the price monitor using the “Add Existing Listings” process. It could also be used to remove items from the price monitor while keeping them on your eBay store. This option removes the listing from eBay and leaves the list in Price Monitor with a green relist button in it's target price column so you could relist it in the future if you wish. If you want to remove the listing from both eBay and DSM Price Monitor for whatever reason, this option will work for you. 4. 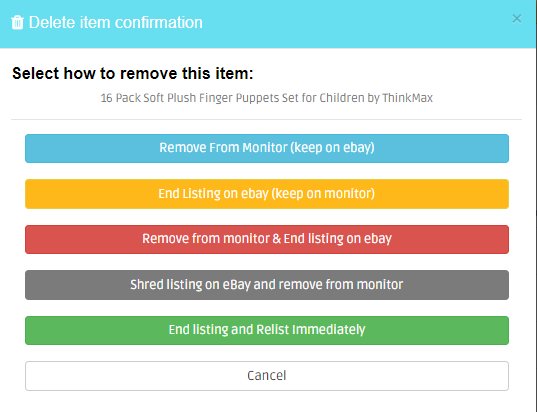 "Shred listing on eBay and remove from monitor"
This last option is used to “refresh” items that you don’t want to remove. There is an upside and a downside to this action. On one hand the item will loose all it’s selling history but it will appear new in the eyes of eBay’s search engine which might lead to new sales.